Cool shirt for those "love them Yak's" simmies. 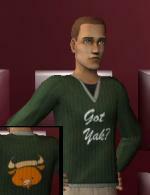 Straight off the block for The Sims 2, this shirt is a green mean Yak loving machine. Viva! Straight from the icy hills of Novaya Siberium, The Sims Zone Industries is proud to present HPE 2.0. After deliberate accidents and faulty mechanics the final version of HPE 2.0 has finally been completed. This high quality entertainment projector will give your sims their money's worth. A castle is a home, that should never be forgotten. And with this gracious beauty you are one step closer. These tiles are just what you need on a bathroom counter. The elegance and beauty is far from over. It once was green, but now is blue..Blue Aqua is just what that kitchen needs..home or restaurant. Once upon a time, there was a really ugly counter. It was green and had black dots on it. But we have changed it all. 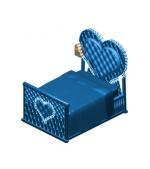 It's blue, it's not pink or purple, so what more can your sim ask for? TSZ working to get rid of the ugly Love Bed and Lime Sofa... We'll be there for you.